Saint Mary’s is closed for the Easter Holidays. We hope everyone has a lovely break. See you on April 30th @ 9:20 am! Video of 3rd Class when they went to Córfhéile! Super! Video of Ms Biggs’ Senior Choir, again at Córfhéile. Excellent! Many thanks to all those who helped out at the bag pack! We were so lucky to see the amazing display of quality history projects in the Hall on the Wednesday of Artefacts Week. Such a lot of research was on display and it all added up to a truly educational and enjoyable experience for us all. Well done to Mrs Kavanagh, her team and EVERYONE who took part. Bravo! 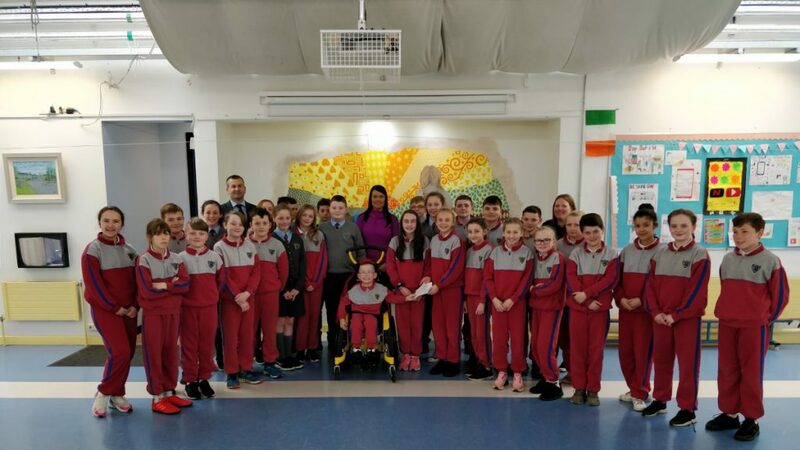 Meet 5th Class, who presented a cheque for €1,420 to Kyle Fitzpatrick, in support of the Kyle’s Wish To Walk Fund which has now reached its target! 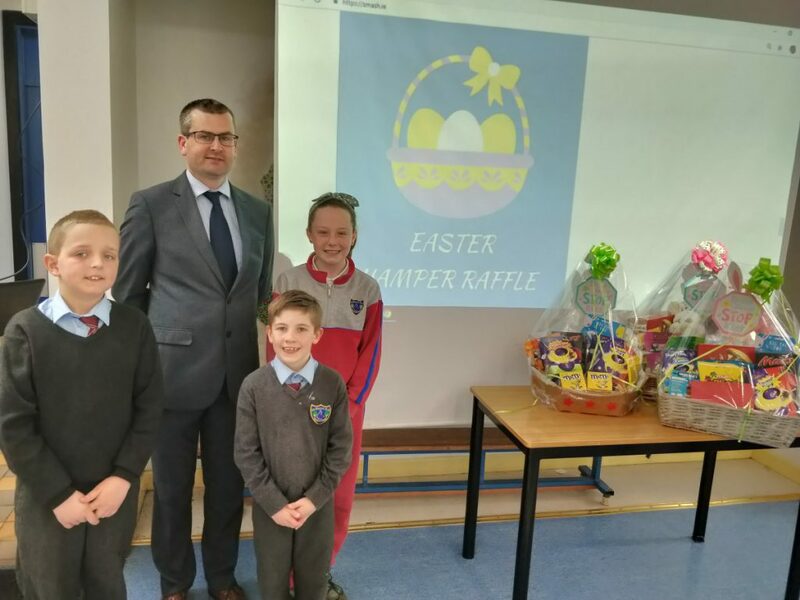 Also pictured are Kyle’s mam Janine, class teacher, Ms Louise O’Connor and Principal, Mr Paul O’Connor. Well done to everyone involved and the best of luck to Kyle and his family as they travel to the US for his important surgery. 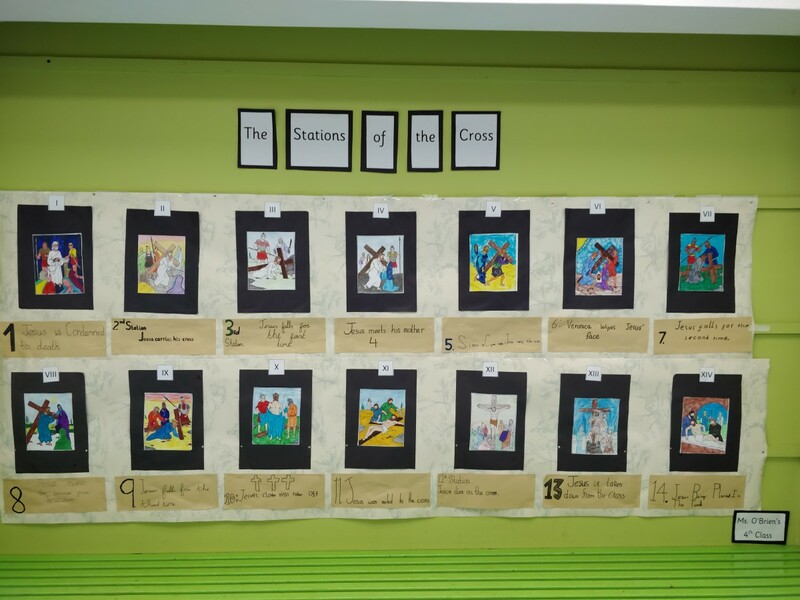 Above, the wonderful depiction of the Stations of The Cross, calls to mind the REAL meaning of Easter and is a tribute to Fourth Class. Well done. Congrats to the winners, pictured below with Mr O’Connor! 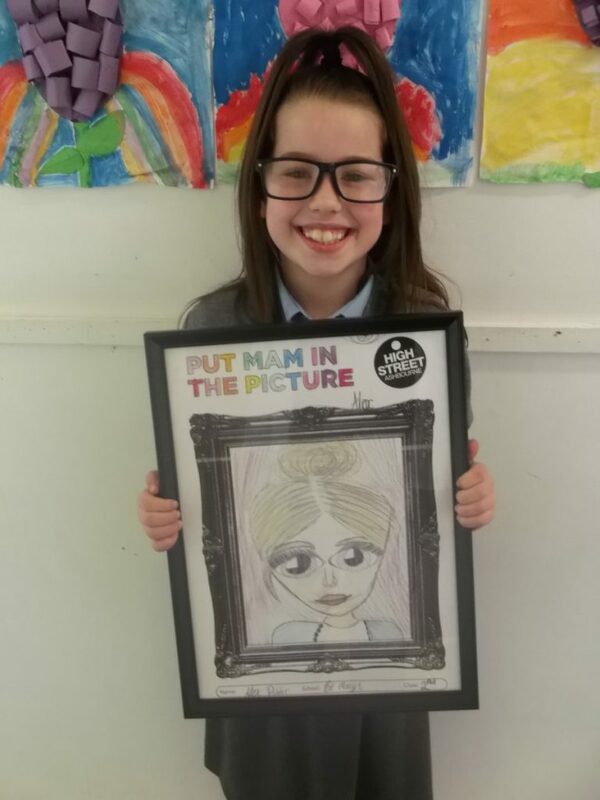 Below is Alex with her beautiful drawing, entitled, “Putting Mam In The Picture”, a recent winner in the High Street Ashbourne colouring competition. What a lovely picture! Well done Alex. 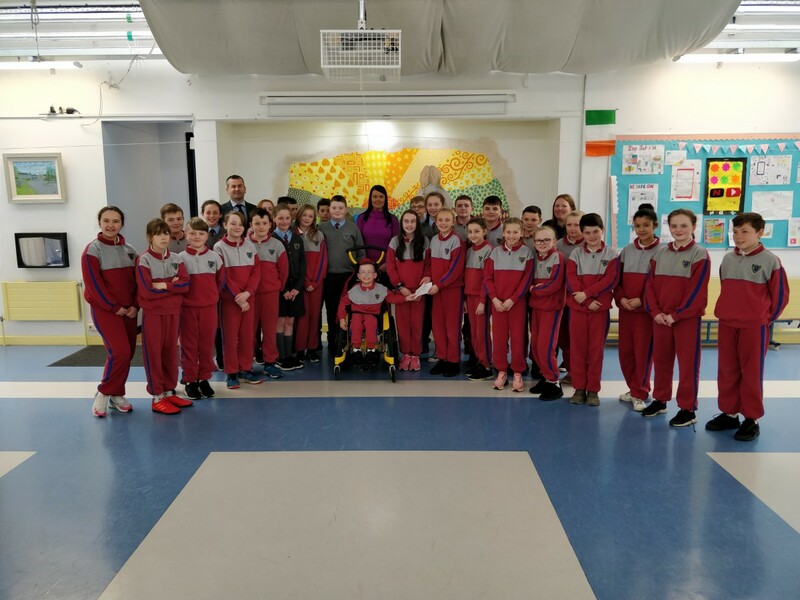 Mr Slattery’s Sixth Class recently completed engineering projects where each group had to design, construct and test a bridge, crossing an expanse of water. The quality of the work was extremely high and the varying designs demonstrated great creativity and ingenuity. Please come and share a cup of something hot on Thursday, May 2nd in the school hall from 9:20 a.m. Catch up with friends and support a good cause at the same time!!! See the videos of 3rd Class and Senior Choir at Córfhéile in March. Brilliant! They're at https://t.co/nsRCAc4tta. Enjoy! St Mary's National School is closed for the Easter Holidays. We hope you all have a wonderful break. See you on TUESDAY , April 30th at 9:20am Happy Easter! Saint Mary's National School will be closed from 12 NOON, today, Friday, 12th of April until TUESDAY , April 30th at 9:20 am. FYI, the teachers ONLY, will return on Monday 29th for an In-Service Training Day. Good luck to everyone who has bought tickets for the big draw tomorrow! Today is the last day to buy raffle tickets for the big Easter draw. Takes place tomorrow... Don't miss your chance to win!